This salad is one that I found on Pinterest a while back, and tweaked the ingredients to suit our taste preference. Adam & I love it so much that we make it about once a week, and since it keeps so well in the fridge, we'll snack on it all week long. This is the perfect salad on it's own for a light lunch, or as a side dish to chicken or fish. It's also a nice, healthy alternative to bring to a Summer BBQ or get together. Prepare quinoa according to manufacturers directions. Set aside & allow to cool. Place chopped kale in a large bowl. 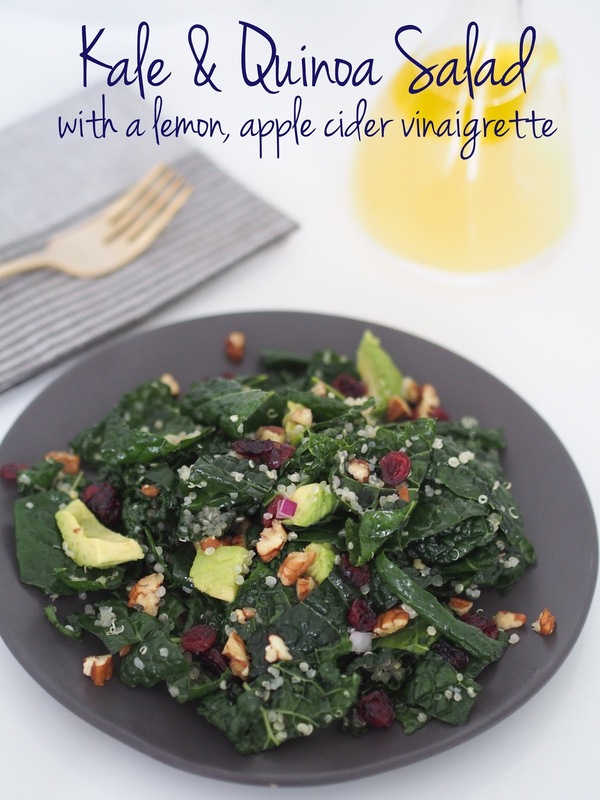 Add lemon juice, apple cider vinegar, olive oil, and massage into the kale to really coat every piece. Add in sugar substitute, and a heavy pinch of salt & pepper. Toss to combine and allow to sit for a few minutes to absorb the flavors. Next add in the cooled quinoa, red onion, pecans & cranberries and lightly toss. Finish by plating the salad, and topping with desired amount of diced avocado.